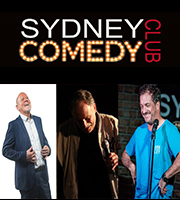 Mick Meredith is one of Australia’s most in-demand comedians for the past 20 years and one of the countries leading comedy acts with appearances all over Australia and internationally from PNG to Egypt. Mick has appeared on film, TV and radio including The Footy Show, Mornings with Kerri Ann, Thursday Night Live, Joker Poker, The Comedy Channel, Stand-up Australia, Triple M, 2GB, 2DAY FM The Sydney Cracker Festival Gala, The Darren Sanders Show, Talking Comics and feature films Pitbulls, Bloody Hell and Footy Legends. As well as LG, Picnic, Nicorette, KFC and AAPT commercials and featured comedian on The Footy Shows best of the comedians DVDs 1 and 2. The highlight of Micks’ career has been shows abroad for the Aussie armed forces and federal police in East Timor and Cyprus and for 25 different nationalities in The Sinai in Egypt. Mick has also produced his own albums including Man United and Mid Laugh Crisis and the live DVD 100% Mick. Sydney comedian Brett Nichols has been knocking them dead for over a decade in comedy rooms all over the country. He has strutted his stuff on THE FOOTY SHOW and The Comedy Channel’s STAND UP AUSTRALIA, and has entertained Aussie and New Zealand troops in East Timor and the Solomon Islands. His versatility and ad-libbing excellence sees him transfer every show into a night you’ll never forget! Brett is also a fine dramatic actor. In 2014 he starred in “The Comedian”, a powerful 15 minute short drama directed by Brendan Donoghue, which screened at film festivals around the world, including the Melbourne Film Festival and Flickerfest, in 2015. It also won ‘Outstanding Short’ at the Short Sweet Film Fest in Cleveland, Ohio, USA.